Maintaining safety-critical commercial vehicle systems also means guaranteeing safety. That’s why you should rely exclusively on OEM-quality replacement parts from Knorr-Bremse. They offer the right quality, reliability and a long lifespan. Our electronic product catalogue is accessible online around the clock. 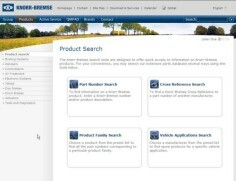 It includes all Knorr-Bremse products, plus relevant aftermarket information. Our secure online ordering process, supported by a commercial hotline, makes procurement quick and easy.